ZoukOut 2015 is already one of the year's most anticipated events, boasting an incredible lineup of superstar DJs like Kaskade, Tiesto and Armin van Buuren alongside highly respected names like Dixon, Paul Kalkbrenner and Jamie Jones. But besides the two main stages, one of the underrated showcases of this year's festival is the return of their local tent! Now called the Kaleidoscope Arena, local radio station Lush 99.5 FM has been tabbed to specially curate the bill there, and you can always trust in their taste. In the past few months, Lush has already been hosting monthly parties at Velvet Underground, Zouk featuring local artists, so it's only natural that they'd be recalling some of their famed alums to the ZoukOut edition. On that end, former Kaleidoscope acts like Syndicate's Vandetta and Darren Dubwise, alongside Singapura Dub Club's Jean Reiki makes perfect sense for a large platform such as this. Elsewhere Syafii (founder of Good Times) and Kurt (from #vinyloftheday) look to bring some off-kilter, bassy, four to the floor vibes to the proceedings. All-female collective ATTAGIRL! will be fully represented as well with A/K/A Sounds, DuriO and Jaydah going on one after another to provide some heat from the low-end. Hip-hop purists will also have something to look forward to with turntablist extraordinaire KoFlow (Solid Gold) and live performances from spitfire rappers THELIONCITYBOY and ShiGGa Shay (Grizzle Grind Crew). From live soul and rap to DJ sets spanning dub, techno, house, trap, grime, drum & bass and more, the Kaleidoscope Arena looks to have a little something for everyone. And if our previous experiences at ZoukOut 'Localized' tents are any indication, this stage might just be the sleeper hit of the party. 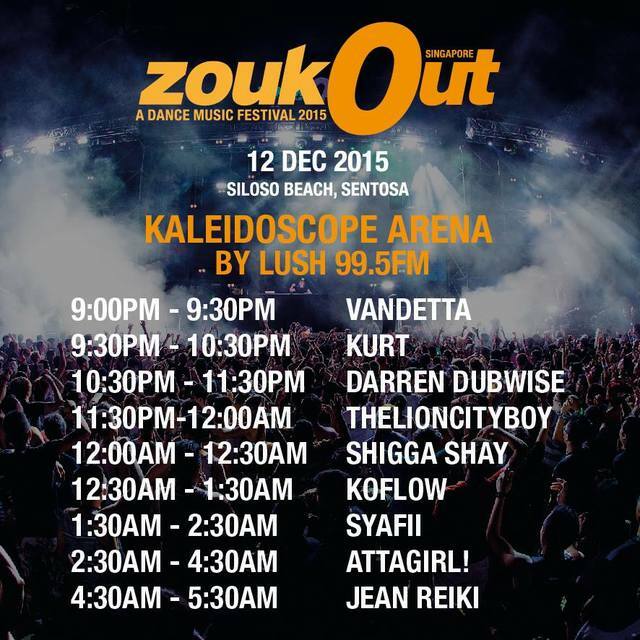 ZoukOut 2015 takes place on 11 December & 12 December at Siloso Beach Sentosa. Click here for further details on lineup and ticketing.